Leo Russell talks to us about working in mental health services and his current role as a Principal Clinical Psychologist. My initial role was in a Child and Adolescent Mental Health Service in Torbay, which was a great place to cut my teeth as a qualified psychologist. However, my real passion was adult mental health work and I took up a post in Somerset Partnership NHS Foundation Trust in 2011. I have since developed an interest in medically unexplained symptoms and now work in neuropsychology services in Exeter part time and in Adult Psychotherapy services in mid Devon part time. The major change for me has been further developing my passion for intensive short-term dynamic psychotherapy. From the moment I stumbled across this approach, it revolutionised my work. I jumped at the opportunity to attend a training week in Italy and have not looked back since. This has shaped my career progression and led me to work in the fascinating area of medically unexplained symptoms, which I would have never imagined when I graduated. The most difficult thing has been watching the gradual decline of the Social Care System and the NHS by successive governments since 2010. I see the cruelty of this on low socio-economic families every day, causing social problems, psychological distress, and health issues for huge numbers of people. This is quite heart-breaking. I would say two things: firstly, joining people on their journeys of recovery. I consider myself very lucky to witness acts of bravery, courage, resilience, and wisdom every day as people move towards their recovery from mental health difficulties. Second, my involvement in ISTDP has not only changed my work but my life as it has led to networking, collaborating, researching, and learning from exceptionally talented, generous, and humble colleagues from around the world. What a wonderful journey it has been! Our feelings evolve to help us guide our behaviour in ways that support us to meet our needs (Pankseep and Biven, 2012). The profound implications of this have only recently begun to crystallise for me. I would simply encourage myself to take a more curious stance with regards to my emotions sooner and allow this to become more of a compass that can inform my day to day decision making. Find people who help you to learn and give you energy, courage, and joy! Find a mentor, network, and connect with others. One of my mentors, Steve Allder (neurologist), has had a profound impact on my personal and professional development and we have also ended up collaborating and researching together which has been great fun! The Plymouth University DclinPsy course (Doctorate in Clinical Psychology) is fantastic; the course team have wide ranging interests, an incredible depth of experience in the application of psychology and the development of the profession in the UK, and were also wonderful and fun people to be around. The course taught me how to hold a 'both-and' position, the value of integration and research, the importance of critical psychology perspectives, and also about working in complete collaboration with service-users. Crucially, the staff supported me to follow my passions. It has ensured that, as I have developed specific interests in areas of greater expertise, I have also held onto my roots as a clinical psychologist which has allowed me to value different therapeutic models, different psychological perspectives, and above all to keep listening to the collective wisdom of service-users and their families. So many! In my final year the course director, Annie Mitchell, supported us to have a placement in mental health services in Uganda. Two lovely colleagues and I spent five weeks with mental health services in Kampala. It was a deeply moving experience for me and has shaped my development significantly. Yes, very much so. I’ve published papers with Duncan Moss (my research tutor from Plymouth), sought out my former lecturers for advice and guidance (Annie Mitchell in particular has been a great source of support), and remain in touch with many of my colleagues and friends who I trained with (I’m of course biased, but I think they are a special group, and they’ve all gone on to do interesting and wonderful things in the field of psychology). Yes! Without hesitation. 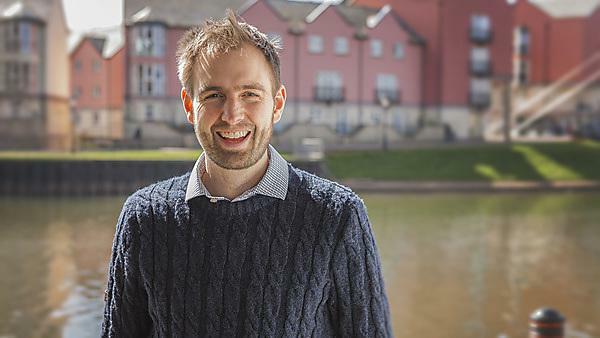 The Plymouth DclinPsy programme is unique in its exceptional capacity to hold and support diverse perspectives, as well as encouraging a critical psychology approach which prepares students perfectly for dealing with the challenges of being a clinical psychologist. The great author Elizabeth Gilbert once wrote, “I want to live in a world full of explorers and generous souls, rather than people who have voluntarily become prisoners of their own fortresses. I want to live in a world full of people who look into each other's faces along the path of life and ask, ‘Who are you, my friend, and how can we serve each other?’” That was my experience of the Plymouth University DclinPsy programme and I am extremely grateful for my time there. For more information about studying Clinical Psychology, please visit our DClinPsy Clinical Psychology course page. For more information about our range of courses within the School of Psychology, please visit the school page. If you would like to find out what other alumni from the School of Psychology are currently doing, please visit the psychology and social sciences interest area.